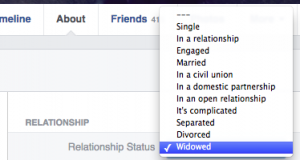 ​I don’t like the label “widow”, maybe because it was forced on me after the death of my husband in 2013. I asked her why it was relevant for this survey. After almost 3 years, I consider myself single, a single parent. But obviously “not yet married/never married” does not apply to me. It still feels strange, after years of confidently checking the “married” box on surveys and questionnaires, to have my circumstances staring me in the face. According to Widowshope.org, the U.S. Census Bureau reports that 800,000 people are widowed each year in the United States. There are a total of 13.6 million widowed people in the U.S.; over 11 million of them are women. I spoke to a few widowed friends about the widow label, and how they prefer to identify. Deb and I had a good conversation about whether or not she even needs labels like this in most of her qualitative research. She allowed that unless the client was looking for feedback on a wedding service or a financial planning product, that perhaps marital status was irrelevant. She added that in qualitative research it is important to know if a potential respondent is living in a dual-income or single-income household because the income thresholds vary accordingly. Quantitative research is a whole other ballgame because sample sizes are large enough to parse sub-groups by these demographic variables and look for meaningful differences. But even in that instance, it’s hard to imagine that in a survey about cheese preferences that whether a person is widowed or not could have any bearing on what type of cheese they liked best. Maybe Wallace and Gromit would feel differently. What do you think? We’d love to hear your experience in the comments, or drop us a line with your thoughts. ← Gender: Do we really need to ask?